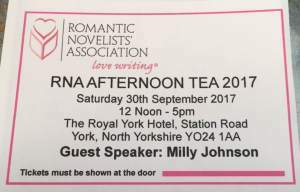 Here’s my take on the Romantic Novelists’ Association Afternoon Tea in York, September 30th. I went along with Julie Heslington, who writes as Jessica Redland, and, as it turns out, we had a blast! Official tickets! Exciting. Or scary! So there we were, Julie Heslington and me, standing outside The Royal York Hotel, all ready to go inside and brave our first “proper” Romantic Novelists’ Association event. Julie had been to a couple of conferences before but, for me, it was my first RNA event, full stop. The York Tea. 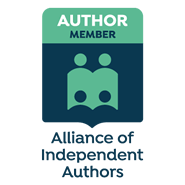 A gathering of well-known, well-established romance writers, who would wonder who on earth we were, and how we dared to darken the doorstep of this place and rub shoulders with the elite of romantic fiction. #CoverReveal and Title for New Christmas Book!